Wally at 6 months old is one BIG domestic turkey. Tundra and Tacoma the two Great Pyrenees are watching in on Wally. A large North American bird (Meleagris gallopavo) that has ornamentally covered feathers and a bare wattled head and neck. There are wild turkeys, but they are also widely domesticated for food. When most people think of a turkey they think of Thanksgiving dinner. While most who raise turkeys raise them for eating, some keep turkeys as pets. And some do both; keep some as pets while eating the others. There are many different breeds of turkeys, however there are two varieties, domestic and wild. The wild turkey lives and breeds in the wild and some are kept as pets. It can fly and is said to be smarter than the domestic. The domestic turkey is the type eaten on thanksgiving. Some domestic turkeys can fly and some types cannot. The domestic and wild turkeys are physically different. Domestic turkeys are much larger than the wild turkeys. A wild turkey is much faster than a domestic turkey. The fastest wild turkey can run up to 35 mph, while a full grown domestic turkey’s pace is a slow walk (females are a little faster because they weigh less than males). Wild turkeys have better eyesight and hearing than domestic turkeys. Only male turkeys gobble; female turkeys make a clucking sound but cannot gobble. A male turkey often fans his tail feathers, where as a female rarely does. Male domestic turkeys have been known to get as heavy as 86 pounds (40 kg). A domestic turkey weighs about twice what a wild turkey weighs. Male wild turkeys grow to about four feet long, including the tail. Females grow to about three feet. A wild turkey can have a wingspan up to 5 feet wide. Domestic turkeys are much heavier and larger than wild turkeys. Female domestic turkeys are a lot smaller than male domestic turkeys. The domestic turkeys that cannot fly can be kept inside a fenced-in yard, much like a fence that would keep in a dog or a goat. The domestic turkeys that can fly should have some type of net to keep them in. Wild turkeys, on the other hand, can fly very well. Unless you keep their wings clipped you need a totally enclosed cage. Two turkeys can be kept in a 90 square foot area that is at least 6 feet high. However the more room you can give your turkey the better. If you have turkeys that can fly, their enclosed cage should have chicken wire surrounding it on all sides and top with a wood frame with a stiff metal dog wire of about 3-4 feet tall along the bottom to keep out other animals and to keep the turkeys in. Turkeys that can fly should be provided with a roost. A shelter should be provided to shield the birds from the rain, wind, hail, sleet and snow, whether it be a simple tarp covering the roosting area or an actual barn stall or small building. The best type of floor is a dirt floor. Hay can be provided as a ground cover. Cement can be cleaned well, however it is hard on the turkeys’ feet. A wood floor can get pretty messy as the loose poop sinks into the wood. The turkey pen should be kept clean. Waste should be raked out and new dirt or hay put down every few days, depending on how many turkeys you keep in how large an area. The more turkeys you keep, the more you will have to clean. Turkeys will take care of their own grooming needs. If you own wild turkeys and do not wish for them to fly away, their wings need to be clipped on a regular basis. Turkeys should be fed pellets as their main diet. You can buy fowl pellets at many farm and pet stores. In addition to the pellets they can also be fed fruits and vegetables. Turkeys will eat some kinds of leaves, weeds, wild nuts, acorns, grass, grapes, kale, all berries that humans eat, Russian olive berries, dogwood tree berries, wild grapes, wine berries, sassafras tree berries, honeysuckle berries and even poison ivy berries. Turkeys will love it if you sprinkle oatmeal on top of their food. My turkeys even love to eat a chicken egg that is cracked on the ground. Wild turkeys also eat insects and small animals. To prevent blackhead disease and other parasites, newly hatched poults (baby turkeys) should be fed a medicated 28% Turkey Starter for the first 8 weeks. From 9 to 14 weeks they should be fed 20-21% Turkey Grower. Chick medicated starter can also be fed, however the Turkey Starter/Grower is better. You can find medicated feed at farm stores. Wild turkey poults under two months old prefer to eat bugs and some will not take to the turkey feed you buy at the farm store. You may have to feed them things such as crickets, mealworms, earthworms, spiders and beetles, which can be caught by hand or bought at pet stores or bait shops. Take caution when catching bugs by hand that they were not exposed to pesticides. For this reason it may be best to go with the bugs bought at the pet store. Domestic turkeys will usually take very well to the pellets and very young turkeys should be fed crushed pellets until they get big enough to handle the full pellet. They sell crumbed pellets at farm stores. If you plan on having your hens lay eggs they need extra calcium. Feeding crushed oyster shells is a great source of calcium. Turkeys need small rocks or grit for their gizzard to grind food, for example dirt, sand, egg shells or oyster shell. A gizzard is a part of a bird's stomach that contains these tiny stones. It helps them grind up food for digestion. Fresh water should always be provided either in some type of bowl or a poultry water dispenser which can be purchased at a farm store. Turkeys should be provided with enough space that they can take care of their own exercise needs. The maximum recorded lifespan for a turkey in captivity is twelve years and four months. For turkeys living in the wild, the maximum is less than ten years, but the average life expectancy of a male turkey is just over 2 years and just over 3 years for females. Some domestic male turkeys often grow too large and too heavy to carry their own weight after their first year. Domestic turkeys bred for food consumption were not bred to live over one year. Prone to blackhead disease. Blackhead "disease" is actually a parasite. It is carried by chickens that are not susceptible to it. It causes the turkeys to get yellow spotted and enlarged livers and is fatal to the turkey. Not all chickens are carriers of this parasite, however, some are. Some types of domestic turkeys grow too heavy to fly and the males usually get so large their legs cannot support their own weight. A male turkey is called a tom or sometimes called a gobbler, and a female turkey is called a hen. In some types of wild turkeys males and females can be told apart by the breast feathers. Males' breast feathers have black tips, females’ are brown. Some types of domestic turkeys must be artificially bred, other types can breed on their own. For a wild turkey the breeding season is in March and April. 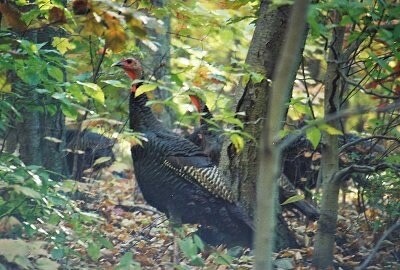 To attract females, in both the wild and domestic turkey, the male will gobble and strut, fanning out his tail feathers. This dance attracts the female for mating. Males breed with more than one female. Even in domestic turkeys that cannot mate without human intervention, the male will still strut around trying to attract a female. The incubation period of a turkey egg is about 28 days. Nesting period is mid-April through mid-June; peak hatch time is about mid-May. 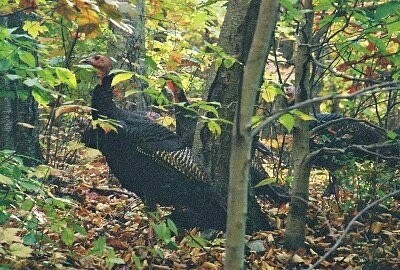 Wild turkeys will lay on 8-16 eggs at a time; 12 is the average. Baby turkeys are called poults. Wild turkey poults cannot fly until they are about 2 weeks old. The name "turkey" stems from the word "tuka," which means peacock in India. Wild turkeys were around long before Europeans colonized America. Wild turkeys should not be confused with their cousins, domestic turkeys (the ones you eat for Thanksgiving). Wild turkeys can be found living wild in North America. They are the largest game birds found in this part of the world. Domestic turkeys can also be found throughout North American, however they are not found in the wild; they are raised by humans for food consumption. The turkey is one of the most popular birds in North America. It is said that Benjamin Franklin wanted to make the turkey the national symbol rather than the bald eagle. 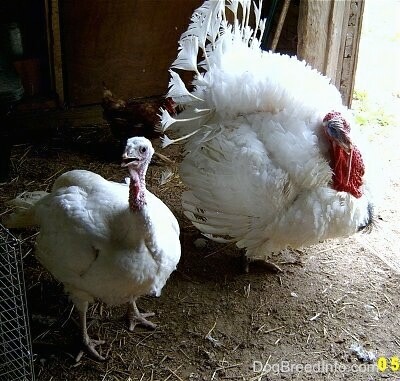 Domestic Turkeys—Wendy, a female turkey (left) and Wally, a male turkey (right) at 10 months old.